The other day I snapped a quick photo of one side of my "studio" because it looked somewhat organized and cute. (and it hardly ever looks this clean). Ha! I have to admit that the only reason it looked this tidy was because I did a quick prep for a Google Hangout (video chat) and the photo you are looking at now is what is behind me when I'm sitting at my desk, which would therefore be my background during the chat. Anyway, I got to thinking about it and I don't believe I have EVER shared a small peek of my studio, like ever, and so I thought you would enjoy a little visual of where the magic happens here at Pen + Paper Flowers. If you are interested in some of the specifics about some of the items in this photo, keep reading. The dresser is the same one from The Abandoned Dresser post a couple a years back. I keep paper, party goodies and some Cricut® supplies stored inside. The giant honeycomb tissue balls are leftover party decor from The Graduation Party. I then transitioned them into Ella's bedroom and hung them from the ceiling in one corner of her room. 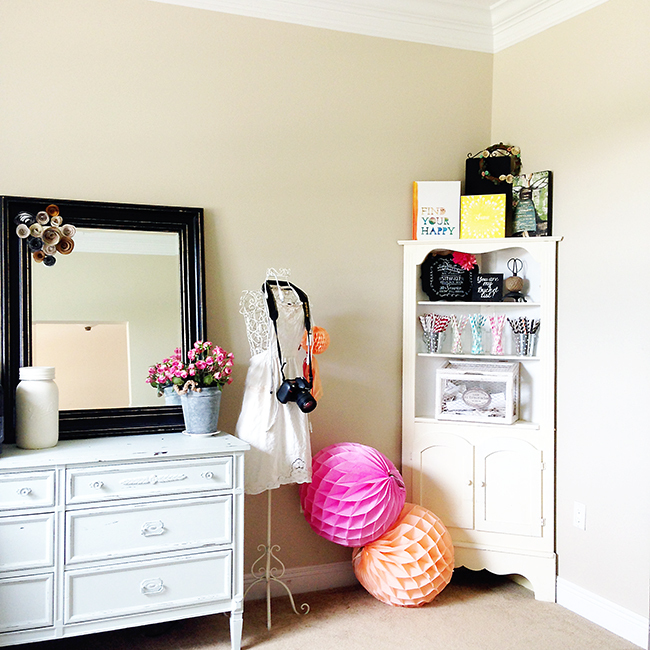 They looked like adorable balloons with the tissue tassels from the party hanging from them as well but I recently took them down when we started her mermaid/dolphin/beach room makeover this Summer. The camera hanging on the dress form is my first (and only) digital SLR. It's a Nikon D70 - an oldie but goodie - like almost 10 years old. I keep it hanging on the dress form for easy access and also wrap the coordinating cord around the neck of the dress form for uploading photos to my computer. So see...it's cute and still practical since it stores items I actually use. The basket on the antique corner shelf came from Hobby Lobby and is what we used at the Graduation Party to collect cards. I now use it to dump all of my receipts for filing later. It actually hangs off the shelf a little bit so I'll probably be doing some rearranging...which I do quite often around my house. You'll find me moving furniture and decor to different areas of my home to change things up since I get bored easily. And there you have it. A quick peek at one side of my studio! Here's to a productive week ahead for all of us!! By the way - I know it's been quiet on the blog over the Summer so until the kids go back to school, follow me on Instagram where I post something almost daily! I love your studio! That black and white with splashes of color is really nice. Awwww! Thank you Dawn! I sincerely appreciate your comment.